I had my first Raspberry and White Chocolate Scone last year, in a little tea shop near where I live. It was love at first bite. 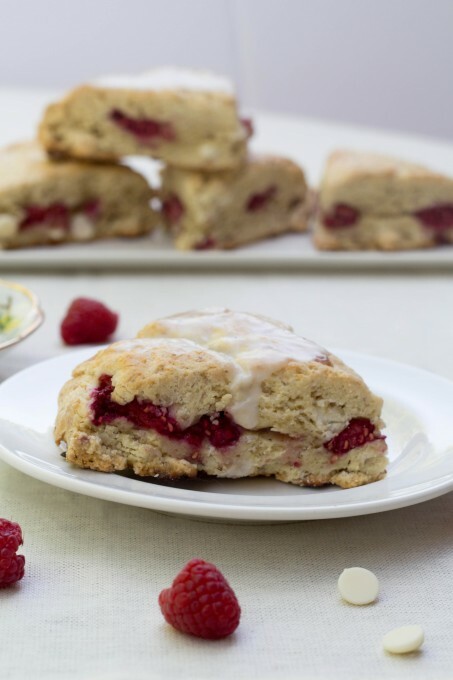 It is no wonder then, that when I saw raspberries on sale this week that I grabbed them to make my own scones. What a treat! These scones are so delicious and moist, that I had trouble stopping at just one. 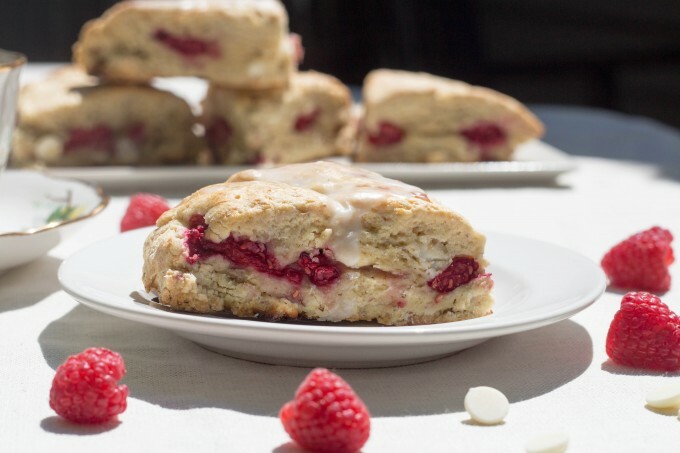 I missed out on breakfast, thanks to an impromptu walk to preschool this morning, so this Raspberry and White Chocolate Scone was the perfect brunch. I got to sit out in the morning sun along with my cup of Earl Grey, and enjoy the beautiful spring weather. My recipe calls for plain flour, however the scones that I have photographed are gluten free. I have used my favorite gluten free flour blend – Namaste Gluten Free Perfect Flour Blend . I find this flour works cup for cup for most foods, except cakes. 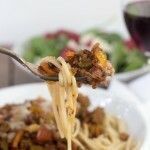 I have also used a little flaxseed meal/flour. It’s my current crush. 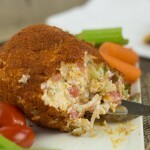 It adds some extra fiber and Omega 3 essential fatty acid. If you want to leave it out, the recipe will work out just fine. 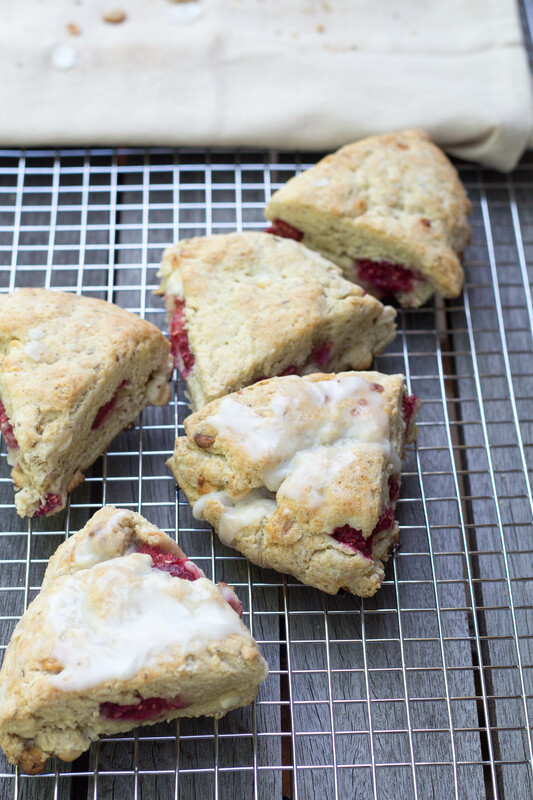 I’ve got a special treat for you today – I have done step by step photos for making these scones. I have mentioned before that American scones are different from Australian scones, so I decided to walk my readers from Down Under through the process. I know, at least, that my mum will be interested! The first step to making scones is to preheat the oven to 400° F. Scones are typically cooked fast at high temperatures. I’ve seen lots of different reasons for this, and every one seems to different! I just do it and it works. Line a baking sheet with parchment paper. You can grease the sheet with butter, but I find the parchment paper works better. Next, mix the eggs, cream and vanilla extract in a small bowl. Set this aside. In a large bowl, combine the flour, flaxseed meal (optional), baking powder, sugar and salt. Next, grate cold butter into the bowl of flour. This is a new trick I have learned. I used to cut butter, then rub the butter into the dough. This new method is much quicker and keeps the butter colder. 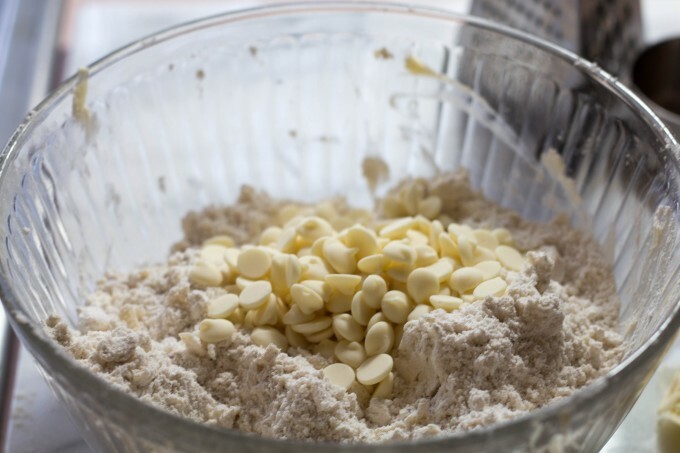 Add the white chocolate chips and mix them around in the flour. Yes – it’s OK to take a few nibbles of those chips before the go into the flour! Form a well in the middle of the flour and tip in the liquids that we set aside earlier. This is another thing I have always been taught with making scones. I don’t know the why’s behind it, but it’s what I’ve always done. Mix the ingredients together until they are just combined. I think this might be why scones work so well with gluten free flours. 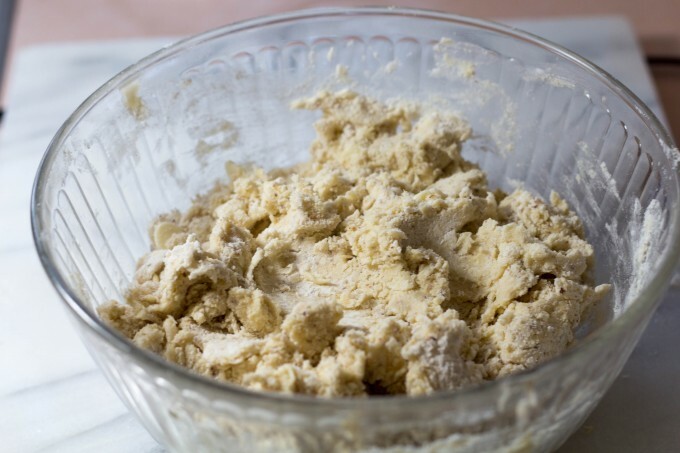 Gluten Free flours don’t like a lot of mixing, and neither do scones. It’s a perfect marriage. Lightly flour a flat surface and tip that dough out. If you didn’t manage to combine all ingredients, give the dough a quick knead but keep it light. 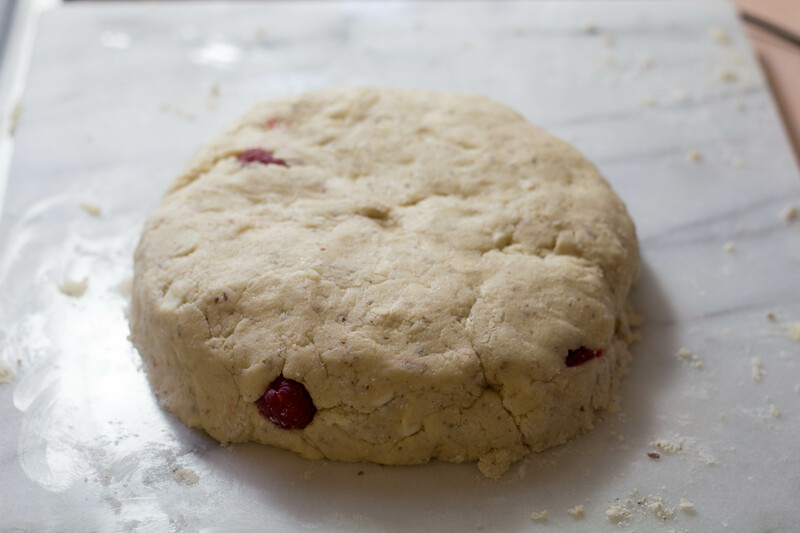 Press the dough into a rectangle, then place raspberries on half of the dough. 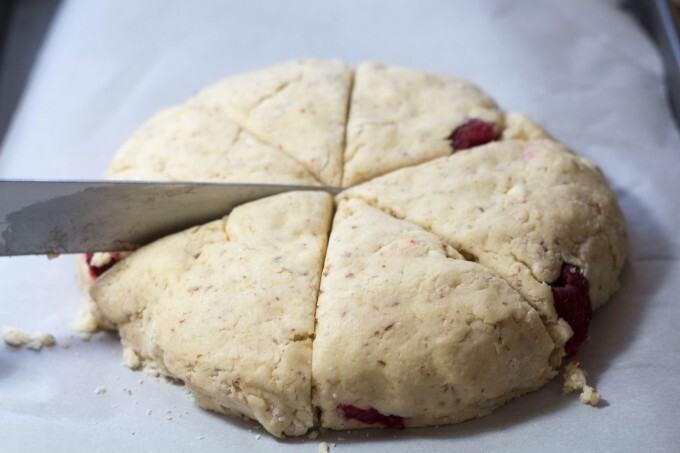 Fold the dough in half, hiding all those delicious raspberries. Press down gently on the top of the dough to form a seal, then form the dough into a circle. Cut the dough into 6 or 8 wedges. This is where Australian and American scones really show their differences. I had never seen a triangular scone until I moved to America! Slightly separate the scones and baste the tops with milk. If you haven’t already washed the egg and cream bowl, you could add the milk to this bowl. Basting gives scones that lovely brown top – so don’t skip this step! 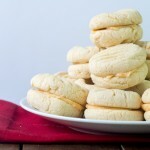 Bake for 20 minutes or until the scones are golden. 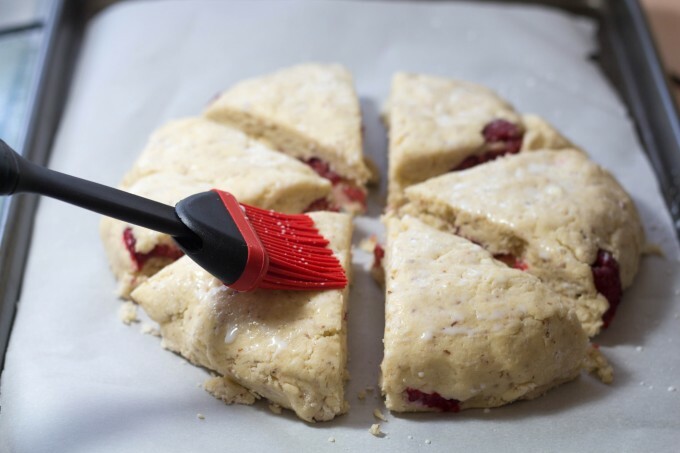 Allow the scones to cool slightly, then transfer them to a cooling rack. While the scones are still warm, lightly spread some of the most delicious glaze you have ever tasted on top the scones. 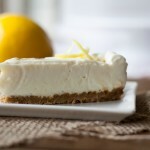 I love this white chocolate glaze – it’s made from white chocolate chips so it tastes like spreadable white chocolate. Yum! 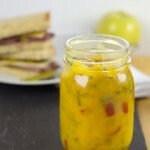 Serve them warm, along with a cup of coffee or tea. Now you too, can experience scone heaven! 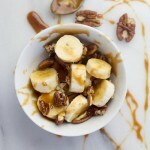 In a small bowl, beat the eggs, cream and vanilla extract. 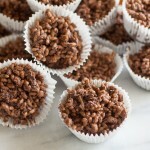 In a large bowl, combine the flour, flaxseed meal, baking powder, sugar and salt. 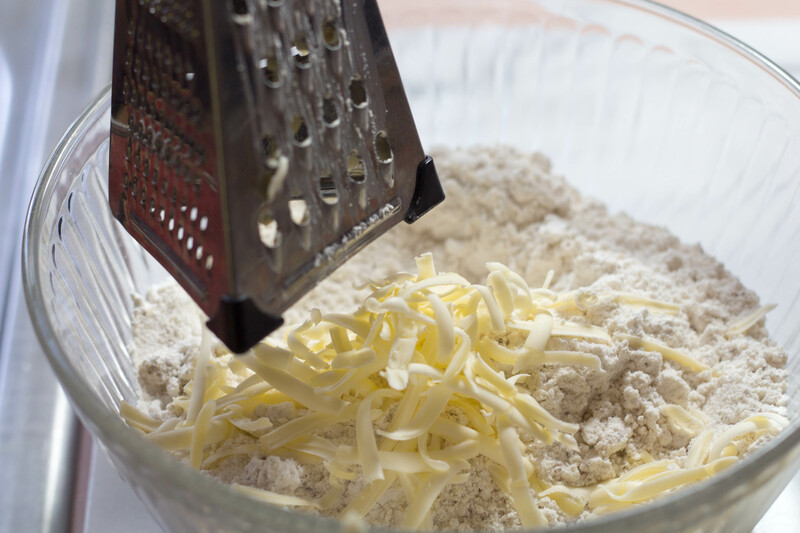 Using the largest holes on a grater, grate the butter into the large bowl. Toss the butter with the flour, then using your hands lightly rub the butter into the flour. 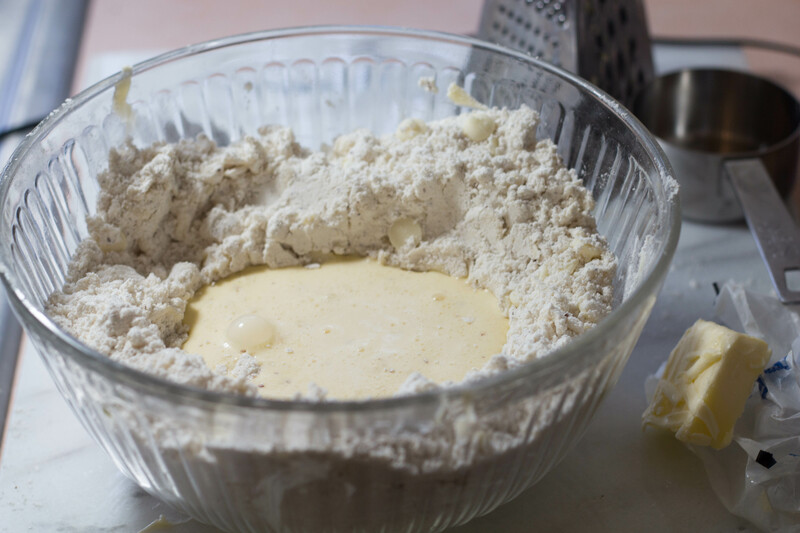 It's good to leave larger chunks of butter in the flour, so don't rub too hard. 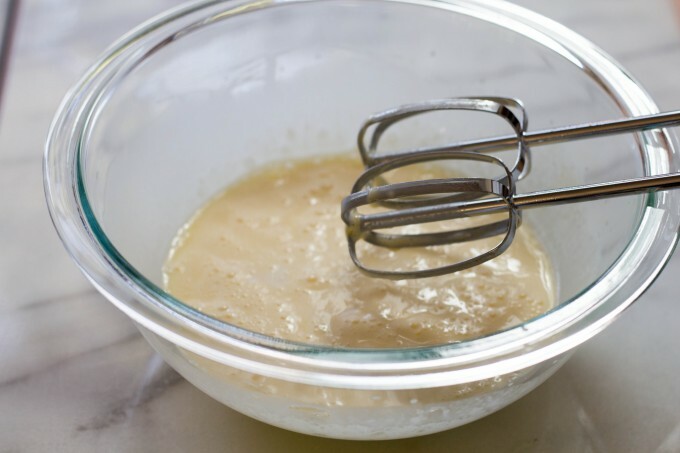 Make a well in the flour, and pour in the egg and cream mixture. Mix the ingredients together until they are just combined. Lightly flour a flat surface, then tip the dough onto the surface. Using your hands or a floured rolling pin, press the dough into a rectangle shape. 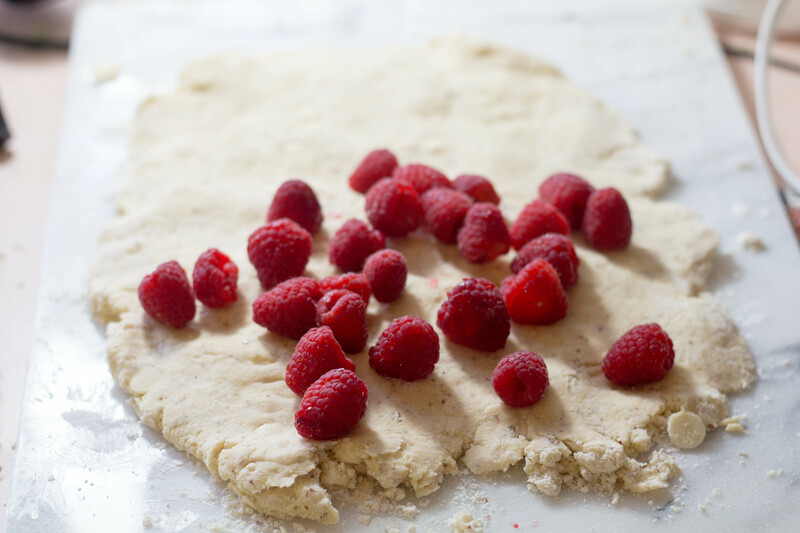 Spread the raspberries over half the dough, then fold the dough in half, covering the raspberries. Gently press the dough over the raspberries then form the dough into a circle. Transfer the dough to the baking sheet and cut the dough into 6 or 8 wedges. Slightly separate the wedges to ensure even cooking and browning. Using a pastry brush, glaze the top of the scones with milk. Bake for 20 minutes or until the scones are golden. Allow the scones to cool on the baking sheet for a few minutes, then transfer to a cooling rack. Spread the glaze over the scones while still warm. In a small microwave safe bowl, combine the white chocolate chips and hot water. Cook in the microwave on low power for 30 seconds. Stir the white chocolate chips and water until the chips are completely melted. 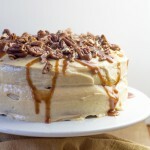 Add the confectioners sugar and mix until a smooth glaze is formed. Cover the scones with the glaze while they are still warm. 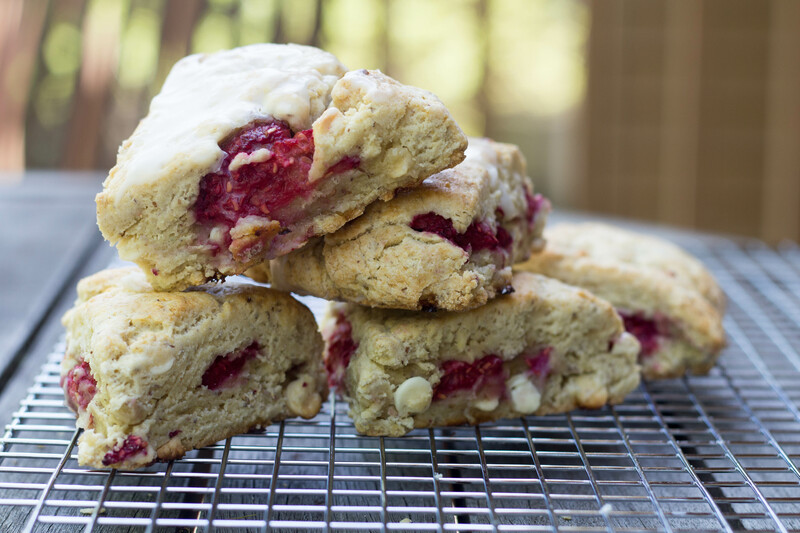 I have been meaning to try and make scones ever since I went to a bakery in Auburn, they were mixed berries…. 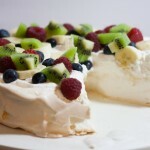 So yummy, but they were a softer texture, are those similar to scones back in Australia? These were a soft texture, but not as soft as the English scones I make. Those are really light and fluffy. I love scones!